Remember the nursery rhyme and song, Old MacDonald Had a Farm? MacDonald raised a diversity of crops and animals. Why? He couldn’t have operated his farm without either of them. For example, grains from MacDonald’s crops fed his animals, which in turn produced manure to fertilize his crops and help them grow. Likewise, remains from crops after he harvested them helped sustain the animals that produced milk and meat for market and his family. 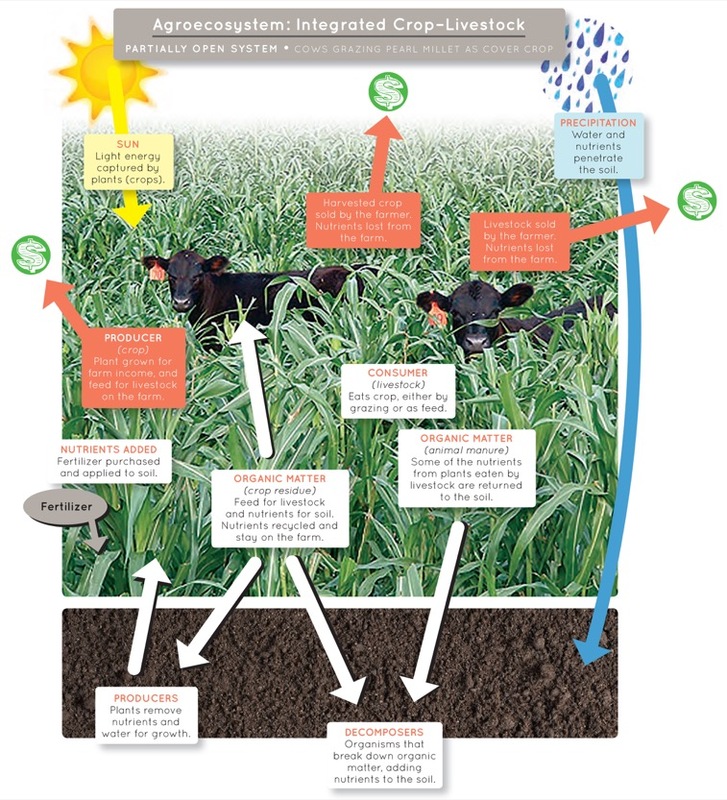 Crops and livestock depended on each other to survive. They formed a system of connected parts—an ecosystem. Today, however, most farmers specialize in livestock or crops. Crops are often grown in monocultures, many acres planted in a single type of crop. As a result, livestock and crops have become disconnected. And farm operations have become less diversified. However, a growing number of agronomists and farmers are exploring ways to re-integrate livestock and crops. They see opportunities for farmers to be more efficient, more profitable—and provide more benefits for the environment.